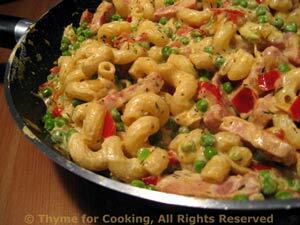 Pasta with Ham and Peas, Thyme for Cooking one dish dinner. This is such a colorful pasta dish it makes me happy just looking at it. Using frozen peas and deli ham has this is ready faster than you can cook the pasta. A bit of creamy goat cheese brings it all together. Cook pasta according to package directions. Cook pasta a minute less than usual and let it finish in the sauce. Heat oil in large skillet. Add onion and pepper and sauté until tender, about 5 minutes. Add ham, paprika and sauté 5 minutes longer. Add chicken stock, thyme, mustard and stir to combine. Add peas, cover and simmer until peas are tender, about 5 minutes. Add goat cheese and stir until melted and combined.